As the back cover states, this is a story of love, persuasion and choice. Savarna is dating two women, hasn’t told her conservative parents she is gay and must listen to endless appeals for her to get married and have a baby. 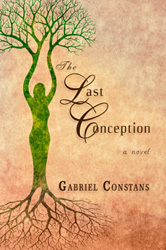 After deciding she loves Charley, the woman who has waited patiently for Savarna to get ready to settle down, Savarna begins to listen to her own biological clock. When her parents accept her coming out then increase the pressure to have a baby, she can’t quite understand why they are so insistent. Thus begins “The Da Vinci Code” part of the story. Her parents belong to a secretive religious group that meets once a year in southern India. As it turns out, Savarna is the last viable option for continuing a direct line of descent from the group cult’s original leader. Her grandmother flies in from India with tangible proof, in an ancient iron cask, a robe and a gold ring. Savarna still doesn’t quite believe until she goes to India to meet members of the group for herself. Since she and Charley want to have a baby anyway, she begins artificial inseminations, and progresses through all the dreary and heart-wrenching steps all couples climb who have difficulty conceiving. After in vitro fertilization fails, Savarna and Charley decide to adopt and begin the process for that. The parents are angry and disappointed, pleading with Savarna to keep trying to conceive. So there you have it. Part love story, part mysterious cult-religious blathering, part “We’re lesbians, let’s have a baby.” The creepy thing is that while reading this book, I kept trying to turn it into some sort of futuristic, sci fi, time warp thing. I don’t know why; probably just me. The mystery part is not satisfactorily resolved, and the baby conception story really isn’t either. Posted June 30th, 2014 & filed under Entertainment. Does Hollywood still have a gay problem? Thank you for taking the time to read and review the book Ms. Norris. The mystery and conception portions of the story are designed to be ambiguous, so readers’ can come to their own conclusions. I hadn’t thought of this as a futuristic, sci fir, time warp kind of tale, but it is an interesting idea.